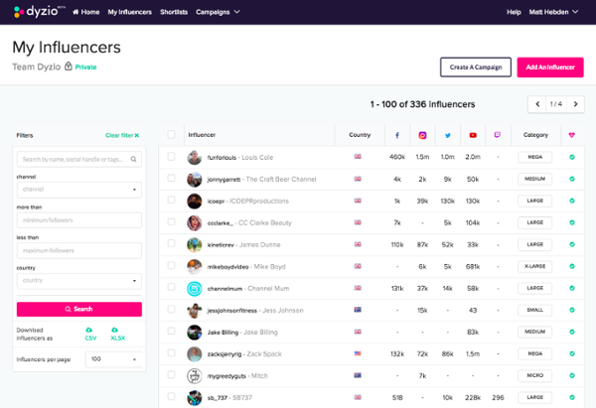 Dyzio - Create Influencer Marketing Reports in Minutes. Create Influencer Marketing Reports in Minutes. Are you and your team spending hours each week trawling through social networks and updating spreadsheets to produce Influencer marketing reports? dyzio can now do all this for you - with 100% accuracy and up-to-date data - with these 3 simple steps. Here's a quick overview of how it works. Sign-up for a free dyzio account, log-in, then create a new campaign and add the influencers you're working with on this campaign to your private database. If you're just looking to create a new report there's no need to invite them to join dyzio. If you want to request access to their private channel data, you can invite them at a later date. Add the links for each campaign post you want to track. dyzio can track influencer or social posts (video or image based) from Facebook, Instagram, YouTube and Twitter. You can also manually add Snapchat and Instagram stories - so everything is captured on one place. dyzio also let's you confirm that you're adding the right post, right within the app. View the live data in your campaign dashboard, filter by channel or influencer and sort by views, engagements or other key metrics. You can also share a number of reports with clients or colleagues, just copy and share the link and away you go, no login is required for them to view the reports. Plus when they click on the link, the data in the reports is always up to date. If you have specific internal or client reporting needs, we can create custom reports based on your requirements and add them as new templates to the platform. If you'd like to see how dyzio can save you hours of each month, then please book a quick demo and we'll be in touch today.